In a world shrouded in shades of grey, we make things black and white. Vincent Young are specialists to the construction, property, engineering, infrastructure, resources, employment & workplace relations industries. Our Construction team, led by Brett Vincent, stands at the gritty interface between the site and the rest of the world. Our Property & Projects team, led by the highly experienced Mike Ellis, works to achieve your project and transaction goals within the risk profile appropriate to you and to the deal. Our Employment & Workplace Relations team, led by Erin Lynch, provides practical, timely and strategic advice on all aspects of employment and industrial relations including recruitment, work health and safety and enterprise bargaining through to termination and post-employment restraints. We are hands on. We manage every matter as if it were our own. For each matter, we mix and match our lawyers and consultants to seamlessly produce cost effective, high quality work consistent with the client risk profile. 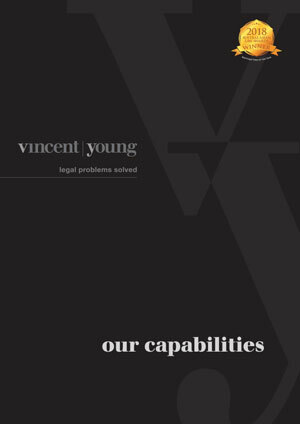 Vincent Young is a true boutique construction, property & projects, employment & workplace relations firm. Each of our Directors has leading law firm backgrounds and we provide this top-tier experience at boutique pricing. There are no ivory towers at Vincent Young. Vincent Young is the proud winner of the Boutique Law Firm of the Year 2018 at the Australasian Law Awards. Independent research group, Doyles Guide 2018, recommends Vincent Young as a leading Sydney Construction Law Firm. The listing of best firms and lawyers is compiled on the back of initial online peer-based surveys as well as extensive telephone and face to face interviews with clients, peers and relevant industry bodies. We practice law in the development, building, construction, engineering and the resources industries. If you work in the construction and engineering, development and resources industries, chances are you’ll know a lot of our clients. Founders Brett Vincent and Craig Young. We know the security of payments law inside out – that’s what leads to our success.